I saw this post on Danny’s blog asking for pillow cases to give to foster care girls attending summer camp and knew I wanted to make one. She mentioned something about using blocks you have, so I took a Love block I had made and turned it into a pillow case. I hope the girl who receives it, enjoys the it. I have been doing some more sewing, but it is a present so I will share after I give it. 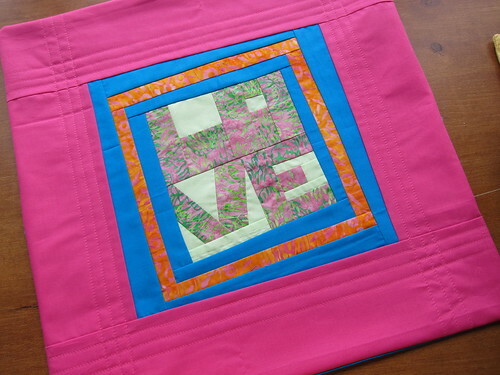 This entry was posted in Sewing and tagged Pillow Cover. Bookmark the permalink. This is super cute and perfect for camp. I’m sure the girl who receives it will think it’s great.